A couple of weekends ago, thousands of people assembled in over 130 cities around the country to picket for freedom of religion. Those faithful followers of the more conservative Catholic, and Evangelical strands see religion, particularly, their brand of religion under attack. And according to many of them, the great socialist, satan, Barack Hussein Obama is behind much of this war on the faithful. “Look at the past 40 years, how our freedoms have been under assault!” lament the pious. and then they produce a litany of losses. Replacing the Christmas tree with a Holiday tree and store employees instructed to say “Happy Holidays” rather than the standard Merry Christmas. This is the proof of a great war on religious freedom. The problem is that this war is a fabrication of the far right, and the politicians that seek to use it to scare people. All this pontificating from political leaders who see themselves as paragons of righteous (a myth in its own regard), is merely a ploy to get a few votes. So what do these protesters and picketers and righteous ranters want? 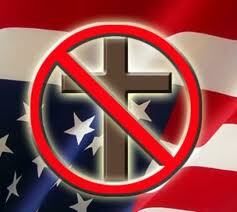 They do not want religious freedom for all Americans, they want their brand of faith to trump all other faiths. I am sure that they do not want the prayers and scripture readings of the over 300 religions and denominations in the USA prayed and read in public schools. I am quite sure that they do not want to see employers opt out of paying for blood transfusions, standard medical practices, or any medication that they deem as sinful. I also do not think that they would be too happy if they were wished “Happy Ramadan” or other religious holiday greeting as they purchased their favorite Oscar Meyer cold cuts at the local deli. This idea, that little Suzy Smith can’t sing Away In A Manger at the holiday music performance at the local middle school or that having insurance companies cover birth control for all the employees of a Catholic Hospital is somehow trampling religious freedom is ridiculous. We all have the freedom to worship and to believe (or not believe) anything we want, but we cannot force other people to do it with us. That is what freedom in America is all about. You see, this war on contraception is idiotic. Never saw such an expresion of stupidity in quite a good time. Where I live, we don’t care about that, contraception is freely available to everyone(of course we still have the church oppose it, but it’s not nearly to the same extent as in the US), we care about violence, famine and poverty, political corruption and education, stuff that is actually important. Those are the things that the church in America should be focused on…I absolutely agree with you. I am reminded of Philippians 2 where Paul quotes a hymn of his day–though he was God, he didn’t think equality with God something to cling to…..in other words, Christ gave up his rights. Right before that, Paul tells us to have the same mind as Christ. And yet here we are, holding on to our rights, demanding our rights at the expense of other people’s rights. If only Christians were more Christ like, maybe then we would actually be bringers of the Kingdom. Very good post. I often see those on the right complaining or warning about the “increasingly secular” nature of our government. The truth is, the government was designed to be secular, and it must remain so. To accommodate or favor only one faith/religion over all others is not the American way, and as you pointed out, there’s also no way that all religions can be given equal standing in our government. It has to be all or nothing to be fair. This certainly doesn’t mean that America, as a nation, must be secular. All religions can flourish here, but their authority must remain within the community they serve. They cannot be allowed to influence the process of lawmaking in this country. Finally, having said all of that, I do sometimes find myself annoyed at those who take every little mention of religion as an offense. People who want to sue over Christmas displays are just not practicing the “live and let live” mentality that they always ask the other side to embrace. If something is actively encroaching on your ability to live your life as you see fit, then OK. But if it’s something you can just ignore as you walk by, then why not do that instead of going through the trouble and expense of a lawsuit? I’m just not militant about this stuff, but I guess for some people the urge to defend their principles is strong enough to make them have that “zero tolerance” attitude.